Franz (Sami Frey), Odile (Anna Karina), and Arthur (Claude Brasseur) sit restlessly in a small cafe with only a few onlookers in sight. The tense mood concerns Arthur's fast-break courting of Odile, who Franz initially fancied. Upbeat music is playing in the background, and the three unlikely acquaintances decide to dance. With unbelievable ease, they break into the Madison, an American dance not usually performed in French cafés. Tapping their shoes on the hardwood floor and swaying with hip, rhythmic movements, the trio create an amazing scene. The entire sequence lasts several minutes, and does little to further the plot, but it stands as a remarkable cinematic moment. The Madison represents one of several unique moments in Band of Outsiders that push the story well beyond its generic conventions. Renowned director Jean-Luc Godard filmed the entire feature in 25 days and rarely started the day with much of a script. His neglect of the typical form may hinder the basic story, but it adds a strong atmosphere of unpredictability to the production. Important events are viewed in extreme long shots, and we rarely see the expected closeups of the star characters. The music cuts at odd places, with brief interludes providing an intriguing sidebar to the central tale. The plot concerns Arthur and Franz's sloppy plan to steal the riches from Odile's benefactor. His estate houses considerable wealth, probably gained by not paying taxes to the government. After only knowing the attractive and naïve girl for several days, the guys convince Odile to help them in their nefarious scheme. The plan's enaction is spurred by Arthur, a small-time gangster with little subtlety. His forthrightness draws him to the innocent girl, who's never met a guy like him. Franz becomes angered by the snub, but plays it much cooler than his brutish counterpart. The events culminate in a robbery attempt that could lead to an unfortunate conclusion. The intimate details of the story really don't vary too much from other gangster, film noir, and romantic pictures released prior to 1964. However, this film stands apart due to Godard's ingenuity and constant references to other novels and movies. Raoul Coutard's cinematography provides a striking picture of Paris and sometimes places the characters into the background. All three actors perform exceptionally, with Karina doing an excellent job playing the shortsighted girl who professes love after knowing a man for just one day. Clad in a sharp suit and black hat, Frey exudes the cool demeanor of a prime-time gangster without the cold heart. Brasseur initially draws sneers in the less attractive role of Arthur, but he makes his actions understandable as the film progresses. The Madison dance sequence is not the only memorable sequence in Band of Outsiders. It also showcases a surprisingly effective "minute of silence," the supposedly quickest visit ever to the Louvre, and jabs at Hollywood and even Godard himself. The overall result is a film that may not grab you immediately, but will remain on the brain for a long time. It definitely works as a good starting point for cinema lovers who, like myself, may be viewing Godard's work for the first time. Image Transfer Review: Raoul Coutard's elegant cinematography shines on this newly remastered print. Very few defects appear during the presentation, and the black & white images look much better than a typical VHS transfer. The focus is surprisingly impressive during the long shots, which energizes the entire story. Considering the film's age, this is an excellent full-frame transfer, and Criterion deserves tremendous credit. Audio Transfer Review: Much of Godard's success stems from his innovative use of quick audio cuts and background noises. This mono transfer presents his originality effectively, especially during the Madison and "minute of silence" sequences. The track may not possess tremendous complexity, but it does well within the technological limitations. Supervised by cinematographer Raoul Coutard, the sound remastering has created a surprisingly clear presentation. Extras Review: Criterion succeeds once again in providing compelling extras for Band of Outsiders. The disc includes significant interviews with star Anna Karina and cinematographer Raoul Coutard. Recorded in 2002 specifically for this disc, both are complemented nicely by clips and screen shots. Karina speaks for about 18 minutes and recounts her film inspirations as a young child. Holding a cigarette between two fingers, she retains a youthful style and demeanor. It is interesting to note that Karina has a Danish background and knew little French before appearing in movies. Coutard has filmed more than 15 features with Godard since 1960 and the release of Breathless. Running 11 minutes, his words cover the lack of a real script or artificial lighting during shooting. The material ranges toward the technical side, but Coutard also provides some worthwhile ideas. One of my favorite inclusions is the Visual Glossary, which presents the diverse wordplay and references to other pictures in Band of Outsiders. Each segment includes narration and subtitles and clearly explains each example. Godard constantly references other French directors in this picture and classic films by masters like Charlie Chaplin. We also learn that the Madison was improvised in one take and stems from Harlem. This disc presents a quick behind-the-scenes glimpse into the production by including footage from the 1964 documentary, La Nouvelle Vague par elle-meme�directed by filmmaker Andre S. Labarthe. We also view clips from Godard interviews in which he speaks about doing everything different for this feature and destroying certain myths. Another quick inclusion is the brief silent film, Les Fiances du Pont MacDonald, which showcases acting by Godard, Karina, and Sami Frey. The comedy offers an old-style framed look similar to those of early movies. The remaining supplements include an excellent 16-page booklet and two theatrical trailers. An essay by poet Joshua Clover and extra insightful items appear in the worthwhile insert. The previews differ only in Bruce Goldstein's added titles to the re-released version. They exude silly, whimsical music while presenting random moments from the feature. 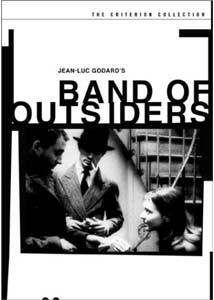 I am embarassed to admit that Band of Outsiders was my first Jean-Luc Godard viewing. I have heard it's one of his most accessible films, which might lead me to false assumptions about his countless other pictures. However, if this film offers any indication, Godard's ability to keep a story interesting while utilizing an unconventional manner could hook me. The plot may not be very unique, but the director constantly toys with the typical conventions to provide a wonderful experience.